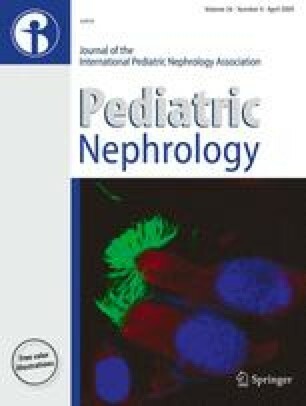 Few published studies have assessed the exercise capacity and/or the effect of exercise in children receiving maintenance hemodialysis (HD). The aim of this study was to determine if twice-weekly exercise for 1 h during HD could improve exercise capacity in children receiving HD. We assessed lower extremity strength (Biodex; dominant extension peak torque in 60° per second, Newton-meters), grip strength (dynanometer, kilogram) and 6-min walk capacity (yards) in ten children (median age 13.6 years, range 8–25 years) at baseline and after 3 months of twice weekly exercise for 1 h during HD. Baseline assessment revealed a mean (1) Biodex of 70 ± 32 N-m/s, (2) 6-m walk test of 589 ± 90 yards and (3) grip strength of 23.2 ± 10 kg, which were 50% lower than the normal value for healthy controls. Patients demonstrated significant improvements in lower extremity strength and 6-min walk test after 3 months of exercise. Our data show that twice-weekly exercise of a moderate intensity during HD can lead to exercise capacity improvement in 3 months. We identified barriers to and strategies for the successful implementation of intradialytic exercise. We suggest that intradialytic exercise intervention may be effective to improve exercise capacity in children receiving maintenance HD. Both authors were supported in this work by the Franklin McDonald/Fresenius Young Investigator Grant of the National Kidney Foundation (S.L.G. as Principal Investigator). A portion of this work was presented in abstract form at the 2007 Annual Conference on Dialysis in Denver, Colorado.